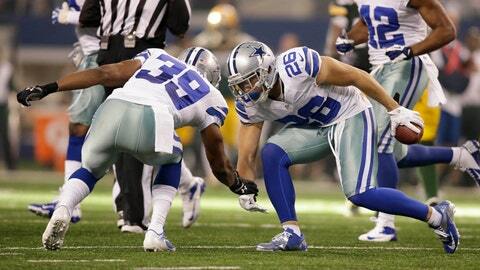 Is the Cowboys’ defense the worst in team history? "The Dallas Cowboys have the worst defense in NFL history." That sentence had been spoken, written and repeated with such frequency that it’s now likely to be etched permanently on the figurative gravestone of this 2013 season — especially because of what many expect to be a playoff-hope-killing burial on Sunday night in Arlington at the hands of the visiting Eagles. The criticism ignores a couple of positives (Dallas, for instance, has 27 takeaways, putting it on pace to almost double last year’s total of 16) and is based on yardage allowed. And there isn’t much positive to argue there: The Cowboys rank last in the league in total defense, allowing 418.6 yards per game. They have already set franchise records for total yards allowed (6,279) and passing yards allowed (4,360). But a true football-analytics person understands that due to changes in the game over the course of the Cowboys franchise’s 54 years of existence, those numbers need to be "weighted" in accordance with the rest of the NFL. Let’s call it "The Inflation System." Is a Cowboys season with 16 games going to include more yards allowed than seasons with 14 and 12 games? Of course. Is a sport in which free agency didn’t come into existence until 20 years ago going to experience some statistical upheaval? Certainly. In 1960, the per-team NFL average for passing attempts and yards â 26 attempts for 170 yards. In 1970, the per-team NFL average for passing attempts and yards â 27 attempts for 161 yards. In 2013, the per-team NFL average for passing attempts and yards â 35 attempts for 236 yards. So you think a 2013 NFL defense is likely to give up more yards than its ancestors? Cowboys radio-broadcast statistician Bob Thomas pitches in on this project to note that to truly measure this year’s awful Dallas defense (and it is that, inarguably) it must be measured not against the yardage given up by others over history but rather using a system that essentially takes into consideration "inflation." The dollar is different as the years go by; a candy bar used to cost 10 cents but now costs a dollar â¦ but because of inflation, today’s candy bar isn’t really "10 times as expensive." Same with stats. The best measurement of what the Cowboys are doing is to gauge their failings against the league averages throughout the years. There’s your accurate system: Enter the average NFL rushing and passing per game by season and compare them to the Cowboys averages in the same categories. The Cowboys enter Week 17 at minus-69.4 yards compared to this year’s NFL average. The Cowboys of 1960, 1962 and 1963 were worse. Other editions of the club: In 2000, Dallas was minus-13.6. In 2010, Dallas was minus-15.8. Last year, Dallas was minus-8.3 for 2000 comparisons. The best year in franchise history for yardage allowed using "The Inflation System": 2003, when the Cowboys were 64.8 yards ahead of the NFL average. Meanwhile, this year’s team is currently the third-worst passing defense in franchise history, with the 1962 and 1963 clubs ranking as poorer. And the 2013 club has the seventh-worst rushing defense in team history. "The Dallas Cowboys have the worst defense in NFL history"? Not really. Common sense suggests that an 8-7 team is probably doing more things right than a near-century of seasons filled with clubs that finished with two, one or zero wins. It’s also easy to cite the 1950 Baltimore Colts here, as they went 1-11 while allowing 38.5 points per game at a time when the league average was 22.9 points allowed. Those poor Colts allowed 50 points in four games and surrendered 70 points twice. So in terms of yardage, this year’s Cowboys aren’t the franchise’s poorest; right now they’re only the fourth-worst in franchise history. And if you factor in takeaways (coordinator Monte Kiffin’s focus), points per possession (the sort of advanced stat just now gaining popularity) and wins (what it’s all about), it’s really not true that "the Dallas Cowboys have the worst defense in NFL history." What’s true is that to many, it feels that way. Which, pending the outcome of Eagles-at-Cowboys, might be indictment enough.